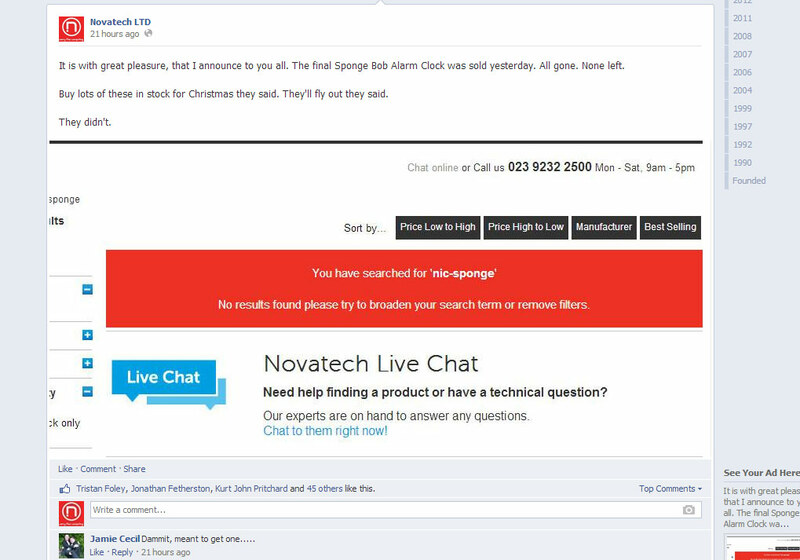 When I first joined Novatech, we did have a social media presence but it was not one person’s focus; it was more of a combined effort by multiple people who were also busy scurrying away at other projects. Making this more coherent, therefore, was important to us – mainly focusing on communicating with you (our customers) via Facebook, Twitter and You Tube. We drew up a manifesto that we now adhere to and many ideas and projects were, and have been, discussed and/or implemented over the years since we began. 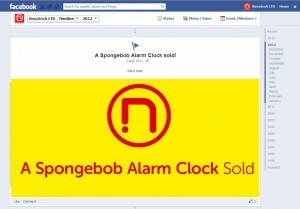 One has always been more pleasurable than the others, however, and that is the saga of our SpongeBob Alarm Clocks. These alarm clocks were a collaboration purchase by employees who want to remain unknown (don’t know why) back in Christmas 2010 as a holiday special and were expected to sell very quickly and not sit around our warehouse using up precious real estate amongst our other glorious technology products. 2nd September 2013, and we have finally sold our final one almost making it a three year anniversary. 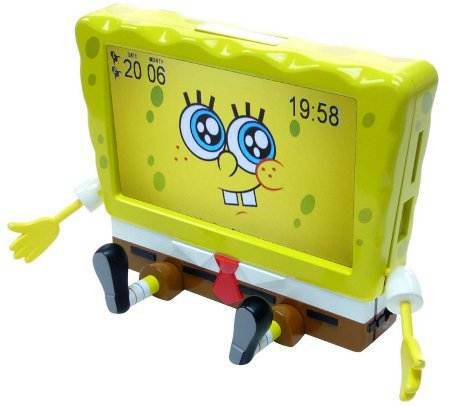 Can these digital photo frame alarm clocks be deemed to be a failure because they took almost three years to sell? Maybe, to some people who spend their day looking at figures, but look deeper and maybe they were more than that. Maybe they were a great purchase for the company. They gave us a truly unique angle to communicate with our customers – using a product that none of our competitors dared match – which in a crowded marketplace of similar companies, selling very similar products, is serious advantage. They allowed us to make fun of the company, relating to a product that wouldn’t damage our reputation as a business technology provider (even some of our most important business customers have had these added onto their orders of expensive servers), and all of our customers, no matter their history with us, could join in with the joke. It became our very own meme. Sometimes, if you’re looking for original content on a regular basis, writers block can of course rear its ugly head. What the SpongeBob story line gave our social media was a safe fall-back if we ever needed it. I dropped the alarm clock in to countless tweets, quite often even if it was irrelevant to the subject. It didn’t matter to me that it could appear to be “flogging” the same subject over and over. I work on the basis that if I find it funny someone else might find it funny too and for the most part, they did. Not only was this saga popular on the outside with our customers, but also there were always jokes coming at me from employees, whenever I was walking around the offices. 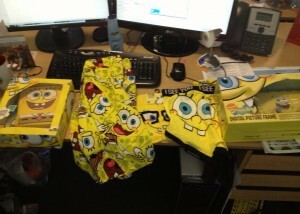 Then when my birthday rolled around it was their turn to play the jokes on me by showering me with SpongeBob memorabilia, which was very greatly appreciated. Most departments around the company, especially the product & stock departments are probably very relieved now this saga is over, however, up here in IT & Marketing… It was a sad day, and I mean it. Sayonara SpongeBob. Will we ever see your like again?